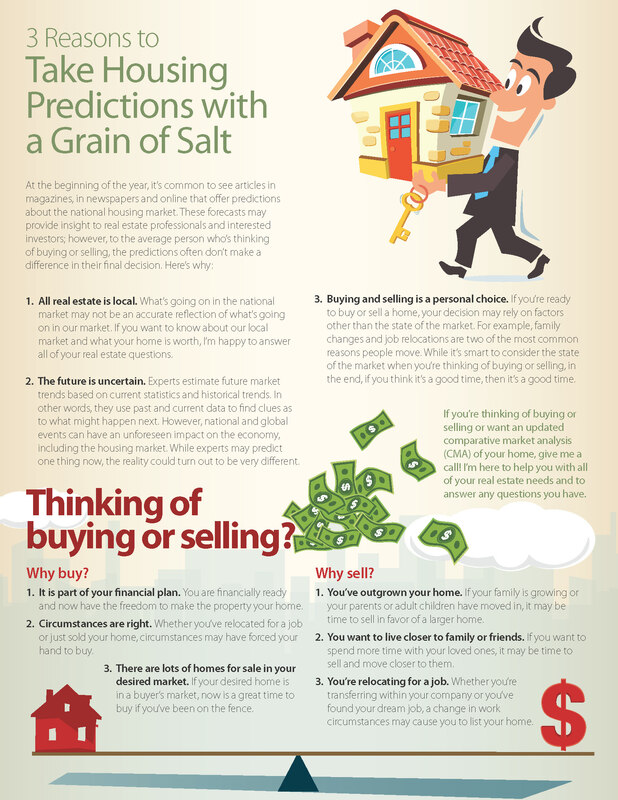 The information I’m sending this month provides an overview of what’s in store for the American real estate market this year based on expert predictions and current price and sales data. Please click here to view: What will the market look like this year? These forecasts provide insight into current trends and paint a picture of what may happen this year. Please note that this is an overall update of the national market, local and regional factors may play a role in specific forecasts for our market. DENVER – With the tug-of-war between rising home sales and shrinking inventory intensifying, January set records for the RE/MAX National Housing Report. Last month topped all other Januarys in the report’s nine-year history with the most sales, highest sales price and fewest days on market. Of the 53 metro areas surveyed in January 2017, the overall average number of home sales increased 4.5% compared to January 2016. Over two-thirds of the 53 metro areas experienced an increase in sales year-over-year, with 12 experiencing double-digit increases. 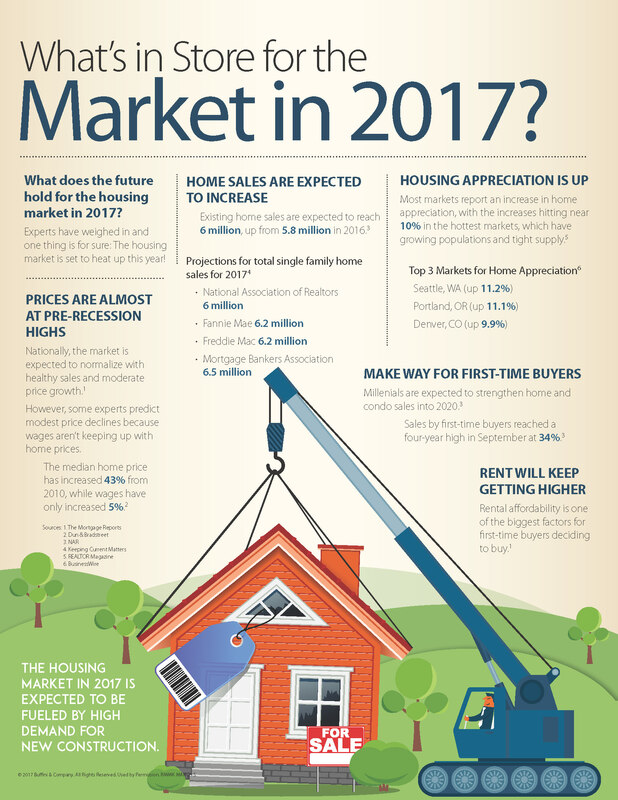 The markets with the largest increase in sales included Hartford, CT +21.6%, Seattle, WA +19.3%, Honolulu, HI +18.4%, Providence, RI +18.3% and Charlotte, NC +18.1%. In January 2017, the median of all 53 metro Median Sales Prices was $208,500, down 3.0% from December 2016 but up 4.3% from January 2016. Only five metro areas saw year-over-year decreases or remained unchanged, with 10 rising by double-digit percentages. The largest double-digit increases were seen in Billings, MT +15.2%, Dallas/Ft. Worth, TX +14.1%, Birmingham, AL +13.7%, Cleveland, OH +13.6% and Portland, OR +13.2%. The average Days on Market for homes sold in January 2017 was 66, up four days from the average in December 2016, but down five days from the January 2016 average. The three metro areas with the lowest Days on Market were Omaha, NE at 38 and Denver, CO and San Francisco, CA both at 39. The highest Days on Market averages were in Augusta, ME at 141 and Chicago, IL at 99. Days on Market is the number of days between when a home is first listed in an MLS and a sales contract is signed. The number of homes for sale in January 2017 was down 4.3% from December 2016, and down 16.9% from January 2016. Based on the rate of home sales in January, the Months Supply of Inventory was 3.8, compared to December 2016 at 4.2 and January 2016 at 4.6. A 6.0-month supply indicates a market balanced equally between buyers and sellers. In January, 46 of the 53 metro areas surveyed reported a months supply of less than 6.0, which is typically considered a seller’s market. The remaining seven saw a months supply above 6.0, which is typically considered a buyer’s market. The markets with the lowest Months Supply of Inventory continued to be in the west, with both Denver, CO and Seattle, WA at 1.2 and San Francisco, CA at 1.4.